Are you ever looking for quick ideas to tell someone Thank you? These are a couple of cards I made that came together really quickly. I simply trimmed some patterned paper to the sized I needed, inked the edges and glued the paper down. Then I stamped the sentiment on. 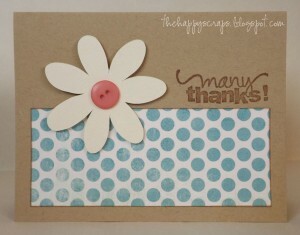 Then using dimension squares, I added a flower that I cut with my Cricut from the George and Basic Shapes cartridge. I simply added a button for the center of the flower. I love when a cute card comes together quickly. 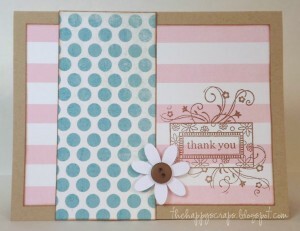 Have you made any cards lately?